Swan Rescue South Wales, (originally Gwent Swan Rescue) was formed more than thirty years ago, and in that time has received many hundreds of calls for help from most parts of Wales. some have come from as far north as Rhyl, but mainly they are from mid-Wales and here in the south. Being the only swan rescue group in South Wales we are the contact for calls from the RSPCA and the police; other calls are received direct from members of the public. Swan Rescue South Wales is run by just a few dedicated people who have recognised the many difficulties swans (and other water birds) encounter almost every day. Most of them result, either directly or indirectly, from human activities, and those involving angling are by far the most frequent. Other problems are caused by power cables, vandalism including shooting, pollution and dog attacks. Swan Rescue South Wales (SRSW) has been in operation since about 1980 – a year in which the need for formalised records of rescue activity was recognised, and since which time record keeping has been seen as a vital element in our objectives. For many years before then, birds of all kinds as well as a variety of wild mammals had been rescued and cared for leading to rehabilitation and release, but with a small operational team a difficult decision had to be made as to priorities; advice would continue to be given, but the provision of actual ‘nursing’ care would be scaled down, and would concentrate on swans in particular. It is worth noting the context provided by the early 80’s; this was the time when the intensive work to prove the connection between swan deaths and poisoning from discarded angler’s split lead shot was at its height, leading eventually to the partial ban involving specific sizes of shot in 1987. Swan Rescue South Wales has no formal structure, it comprises at the core, the two founder members – Ellen Kershaw and Peter Martin (EK & PM). The success of the organisation depends on a network of observers and helpers spread across South and Mid Wales, and to the Borders, and to a lesser extent further afield. The consequences of this is there is a very good chance a swan in distress, for whatever reason, will be spotted, and resources directed to take whatever action is appropriate. It is probably still true the majority of rescues involve the founders, but especially along the South Wales coast there are now other reliable helpers very capable of catching distressed or disabled swans. Now and again a rescue can be effected only with the assistance of boats. In order to be more independent an inflatable dinghy was purchased together with an outboard motor, and the necessary buoyancy aids. But the value of canoeists was soon learnt, and some very difficult rescues were successful only because it has been possible to mobilise a number of canoes as well, which have been used in much the same way as shepherd dogs. There is now good access to a number of canoe clubs (and individual canoeists) particularly the Sea Cadets operating in Port Talbot docks. In some situations powered boats are necessary and valuable assistance has been provided by the Severn Area Rescue Association (SARA) who have helped on the River Wye. Once swans are caught, their condition is assessed, and a decision taken as to the most appropriate treatment. It is very often the case discarded fishing tackle, which still remains be far the biggest single cause of suffering for swans (and to an unknown extent for other forms of wildlife), can be removed on the bank side. Unfortunately there are still far too many occasions when expert veterinary treatment is necessary. Once again a powerful network is in being which time has shown is capable of dealing with almost every type of problem. It is important to stress the treatment of avian injuries is specialised, and so great care is taken in seeking advice direct from vets, but first class links now exist between SRSW and appropriate vets in the area. Depending on the nature of the problem, the decision may be taken to transport a bird direct to one of the excellent swan treatment centres – Wychbold Swan Rescue near Droitwich in the West Midlands, Swindon Swan Rescue, Swan & Bird of Prey Rescue at Amroth in Pembrokeshire, or the National Swan Sanctuary at Shepperton (used to be Egham). Those who rescue but who are dependent on someone else providing treatment. Those who rescue and who have a dedicated veterinary and nursing team who can see a casualty all the way back to release either to the wild or to some sheltered/protected environment. Those who rescue and can provide a limited amount of short term care. For an organisation as mature as Swan Rescue South Wales, with links to so many other groups across the country, good professional communication facilities are essential. It was extremely fortunate sponsorship was obtained permitting the purchase of a complete computer package. Being entirely voluntary, no salaries, wages or honoraria are paid. Nevertheless, there is considerable expenditure arising from the need to pay vets, who are extremely well disposed towards SRSW, drugs, food, materials for the maintenance and improvement of aviaries, replacement of such rescue equipment as nets, swan wraps and bags, travel and administration – stationery, postage, telephone etc. The cost of all of these is met in an ill-defined way between personal expenditure, donations and fund raising. As will already be apparent from previous paragraphs, one of the most important aspects of a successful operation are the contacts built up over very many years. It is these that increase the options available for dealing with a particular problem, and so increase the effectiveness of the operation. 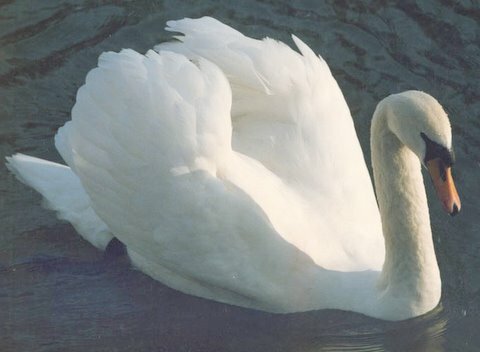 The establishment of a common recording procedure for the reporting of swan rescues, which is sufficiently flexible to allow the reporting of species other than swans. The RSPCA use these report forms. Of the man made problems facing swans, collisions with overhead power lines comes second only to angling related incidents. SRSW is responsible for alerting electricity distribution companies to the dangers and persuading them to fitting bird flight diverters to those lines that have a record of frequent collisions. It is recognised that feuding between swan rescue organisations and angling clubs is counter productive. To this end efforts have been made to cultivate good positive relationships with anglers, and especially clubs. An example of where this has been particularly effective is with Cwmbran Angling Club who, with guidance from SRSW have a code of conduct which truly reflects the responsibility anglers should have when fishing. This code has been made available to other rescue groups as a model to pass on to angling clubs in their own areas. The setting up in conjunction with the Environment Agency of a project to assess the impact of discarded and lost fishing tackle and lead in particular, on swans. In January 2002 this project produced its final Research & Development Report; it contains clear recommendations for dealing with what have become known as ‘black spots’, and will confirm what has been suspected for a very long time – lead poisoning has re-emerged as a very significant problem. The re-emergence of lead poisoning has caused great concern amongst swan rescue groups across the country. Groups are reporting more than 35% of birds with blood lead levels greater than would render individuals poorly, and in the West Midlands it is well over 60%. The National Convention for the Welfare of Swan & Wildlife (now known as The National Swan Convention) is committed to establish the precise reason for this – what is the source of this lead? To establish whether or not the legally used lead dust shot is responsible, The National Swan Convention under the guidance of SRSW has embarked upon a painstaking investigation funded by the Environment Agency, into the content analysis of gizzards and proventriculi of birds dying suddenly, ie. before there is sufficient time for the very small lead dust shot to be ground down by the action of the gizzard. For this, help is needed. Swans which must meet this specification are those which die in road traffic accidents, or as a result of other collisions (power lines etc) and those which are put to sleep because their injuries are too severe to treat, would be suitable. These birds should be taken as soon as possible to a sympathetic vet for the removal of the gizzard and proventriculi. These organs should be frozen and then posted (keeping a ‘proof of posting’ receipt) with the appropriate form to the address indicated.